Few things are certain in the apocalyptic zombie wasteland of The Walking Dead. You could be bitten at any moment. The stupidity of the people around you might get everyone killed. You could be a totally insane killer and then just happen to run into the one therapist left on Earth who specializes in bringing psychotic criminal nutballs back from the brink. But one thing seems to be an absolute surety: AMC is going to continue airing their golden goose until every ounce of fleshy meat has been ripped from its bones, like some sort of metaphor we can‘t quite put our finger on. In a new interview with Vulture, AMC network chief Charlie Collier and head of programming Joel Stillerman address the question of The Walking Dead’s longevity. Asked if they have an endgame in mind for the series, both men are happy to explain that Robert Kirkman’s open-ended storytelling plan means that you can take your precious “endgame” and shove it. 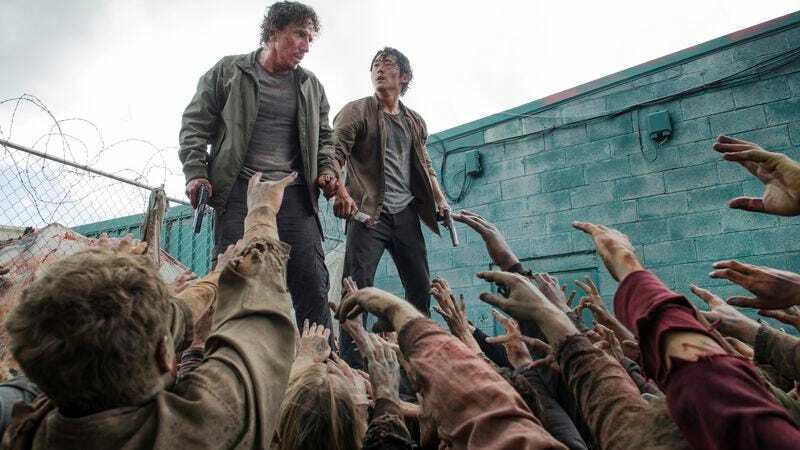 [Joel Stillerman]: If you ask Robert what his motivations were for writing The Walking Dead, he would say, “I loved zombie movies, but I just felt like the worst part of them was always the ending. You always had to manufacture some ending.” So he set out to write this totally open-ended story, and the proof of that is in how vibrant the comics are …He sort of felt like, in real life, this goes on for a very long time. We’re along for that ride. [Charlie Collier]: I will tell you we are not actively talking about the end of The Walking Dead. We’re talking about how to keep this No. 1 show on television feeling as fresh as it does in season six…Our planning is current and future-focused, and it is not focused on the end at this time. In addition to flogging that particular undead horse for as long as they can, the executives also clarify whether they’ll continue to create more spinoff series along the lines of Fear The Walking Dead. One would assume they’d be concerned with the steady drop-off in viewership on that first attempt to make another zombie show, and happily, they say there’s no discussions about it at the moment. (Although they do make sure to drop the “If Kirkman wants to discuss it, we’re open to it” caveat before saying anything else.) Of course, Stillerman also says, “We have a permanent show at 10 o’clock on Sunday nights, and it’s called Talking Dead,” so clearly, they’re ready to throw throw some rotting-face makeup on anyone at any time and call it a show, just so Chris Hardwick has something to talk about.